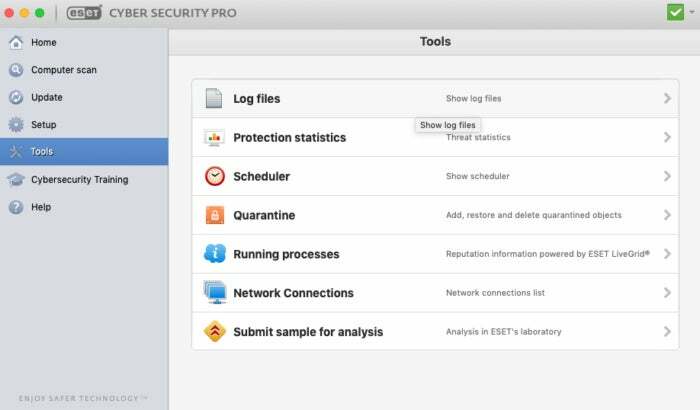 Forget about the cringe-worthy name; ESET Cyber Security Pro is a solid anti-virus suite for Mac. AV-Test gave ESET CSP a perfect score on its widespread and prevalent malware test in December, the most recent test available. Our own checks produced a similar result when testing ESET CSP on a MacBook running macOS Mojave (AV-Test used High Sierra). ESET had no trouble blocking most of the threats on WICAR’s test site of prevalent web-based attacks. The only issue we noticed was that ESET didn’t detect the Adobe Flash hacking team leak; however, we tested on Safari without an active Flash plugin. Moving over to spot checks with malware from the Objective See repository, ESET immediately detected trojans, backdoors, and ransomware. These threats were detected as soon as the malware was unzipped, and ESET alerted us to the issue and began automated clean-up. Depending on the type of malware, ESET’s approach is to remove the malware code from within documents and other files as opposed to deleting the entire thing. That’s not always the case, however; ESET did at times delete entire DMG files. ESET Cyber Security Pro’s home screen. Like many suites, ESET offers to scan USB drives as soon as you plug them in, and you can choose to mark some drives as safe so that ESET will not scan them when you use them in the future. ESET’s Windows protection also comes highly rated. 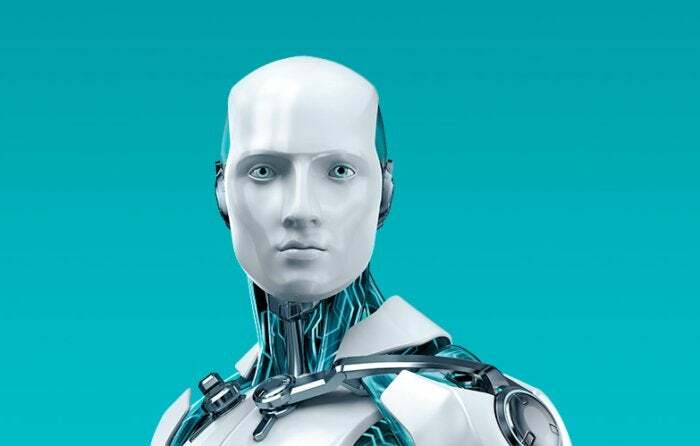 ESET Smart Security received a AAA rating from SE Labs for its July to September 2018 tests. AV-Comparatives scored ESET Internet Security around 98 to 99 percent on all of its tests, while AV-Test’s most recent round of testing did not include ESET for Windows. Overall, ESET’s protection on Mac is very good and ultimately protected us from the more common malicious threats. ESET’s basic user interface on Mac is similar to what we’ve seen on Windows. Navigation is made easy on left-hand rail with all actions carried out in the main part of the window. From the home screen ESET CSP shows green check marks for not just your computer, but also your firewall, Web, and email, and there’s a parental control status indicator as well. A Pro-level security suite is nothing if it doesn’t have extra security features beyond basic scanning and real-time protection. Yet there isn’t a lot here compared to ESET’s base suite. The extras include a firewall and parental control, and that’s it. There’s no password manager as many other security suites offer, or a disk “cleaner” like Norton Security Deluxe has for sniffing out duplicate and unnecessary files. 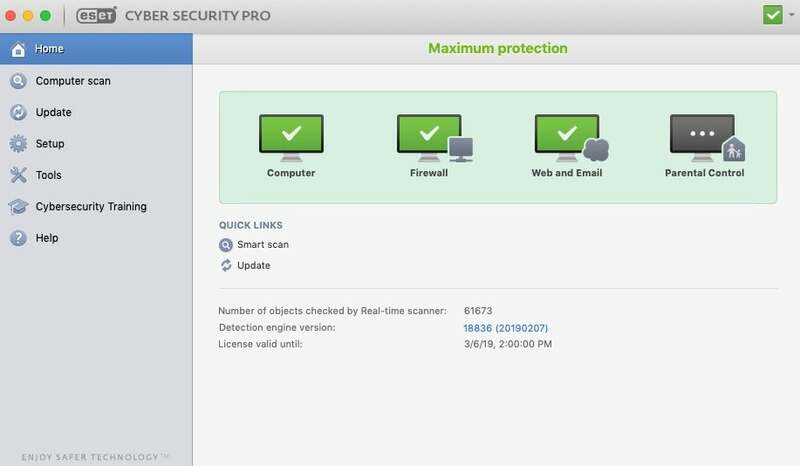 ESET Security Pro for Mac is priced at $50 per year for a single Mac and $10 for each additional Mac up to five, after which it is $5 for each additional Mac up to ten Macs. It's nice that the cost is per-device and you can add as many as you need, so instead of paying $90 to cover up to 5 devices—a common pricing scheme—you can just pay for three or four machines. Still, the price is quite high considering our current favorite Mac antivirus suite, Sophos Home Premium, is just $50 to cover 10 devices. Two other items of note in ESET CSP include the Tools and Cybersecurity Training sections. The former lets you see which processes on your Mac are accessing the network, which is nice for advanced users but a little unreadable for everyone else. We’re a little disappointed this section doesn’t include the “Connected Home Monitor” available on Windows. The Windows feature lets you observe your entire home network, all the devices on it, and any potential issues. Avast Security Pro on Mac has a similar feature, and these network monitors will only become more useful as more essential bits of our homes go online including lighting, thermostats, and appliances. Cybersecurity Training, meanwhile, is a great idea to include in a security suite. All it does is link to a webpage on ESET’s site where you can learn about standard precautions to take against malware attacks, phishing sites, and best practices for password management, two-factor authentication, and more. It’s a great idea as a resource for users unfamiliar with the basics of online security. ESET Cyber Security Pro gives you all the protection you need, plus a firewall, and parental controls at a higher than normal price. The extra tools aren’t much to get excited about, and we’d like to see the current network monitor morph into the connected home feature available on the Windows version. Still, the protection is solid and that’s what counts most with a security suite. This story, "ESET Cyber Security Pro for Mac review: High level of protection at a good price" was originally published by Macworld.